ELK GROVE VILLAGE, Ill. (WLS) -- Javier Bahena-Arrellano is charged with first-degree murder in the stabbing of his estranged-wife at a suburban hospital. 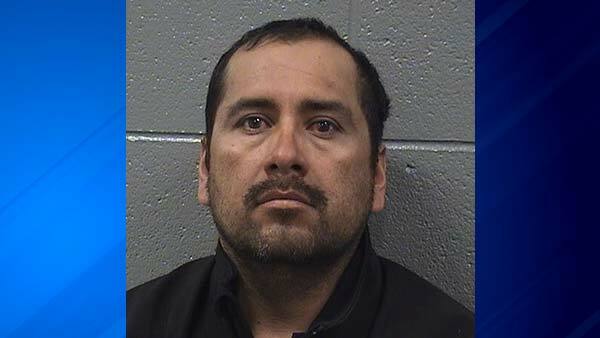 The 43-year-old man allegedly stabbed Francisca Quintero-Montoya, of McHenry, Ill., with a screw driver three times at Alexian Brothers Medical Center in Elk Grove Village at 11:30 a.m. on Sunday. Quintero-Montoya was visiting a sick relative when Bahena-Arrellano forced her into a hospital bathroom, prosecutors said. Her family heard the attack and a security guard detained him. Quintero-Montoya was pronounced dead on the scene. She had been stabbed in the aorta. Prosecutors said Bahena-Arrellano believed his wife was cheating on him after reading messages on her cell phone. He was held without bond in court on Monday. Police said Bahena-Arrellano has a record of domestic violence, including two battery charges, one of which led his deportation. He returned to the U.S. illegally in 2010, according to officials. Alexian Brothers Medical Center issued a release Sunday night saying they are cooperating with the police and local authorities investigating the stabbing, adding that the hospital's "thoughts and prayers are with the family of the victim."